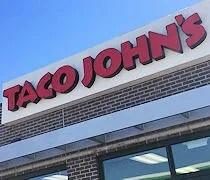 There’s a Taco John’s in Michigan! There’s a Taco John’s in Michigan! I shouldn’t be that excited about a fast food taco chain, but holy cow am I ever. I have a weird relationship with the “West-Mex” taco chain based in Wyoming. My family always went to locations in the Kankakee, IL area when I was little for two reasons. On Tuesday, they did Taco Tuesday where tacos were half price and they also did taco’s for A’s on report cards. I didn’t get a lot of them, but enough to get a couple free tacos. When I moved to Peoria, Taco John’s was there as well. Heck, the location was right down the street from where I worked in Creve Coeur, IL. They still had Taco Tuesday so for five years, that was my go-to on Tuesday’s that I didn’t bring my lunch. A few months ago, I drove to Stevensville to meet a co-worker from Grand Rapids. We were heading to a Chicago suburb and it was easier to meet than for me to go pick him up or him to come to Kalamazoo first. As I got off the highway, I damn near hit the breaks. There was a sign for Taco John’s at the exit. Fast forward to this past weekend. I was taking J and the kids to her parents house in the Chicago suburbs. We wanted to hang around for the Big Latch-On in Bronson Park Saturday morning. When that was over, we got on the road and started heading west. J had said something about lunch and I asked if she could wait until Stevensville because I wanted tacos. Taco John’s is a little ways off the highway…almost a mile… at exit 23. It’s on the corner of Red Arrow Highway and Glenlord Road. It shares the building with a BP gas station with the restaurant taking up a space in the south end of the building. I had planned to get out and eat, but B had fallen asleep so J asked if we could just hit the drive through. Tacos in the car is a little tough, but I got where she was coming from so I said yes. We pulled up to the drive thru speaker and found a much bigger menu than we remember…mostly because it had breakfast and neither of us had seen that before. I ordered four tacos. I could have probably eaten a couple dozen, but I decided to be good at four. Taco John’s doesn’t really do anything different than their competition. The tacos are meat, cheese, and lettuce….but the seasoning they use on their meat is head and shoulders above anything else in the market. I can’t really describe why it’s different..it just is and that’s delicious. Looking at the taco, you’d never guess that it was any different than the others. 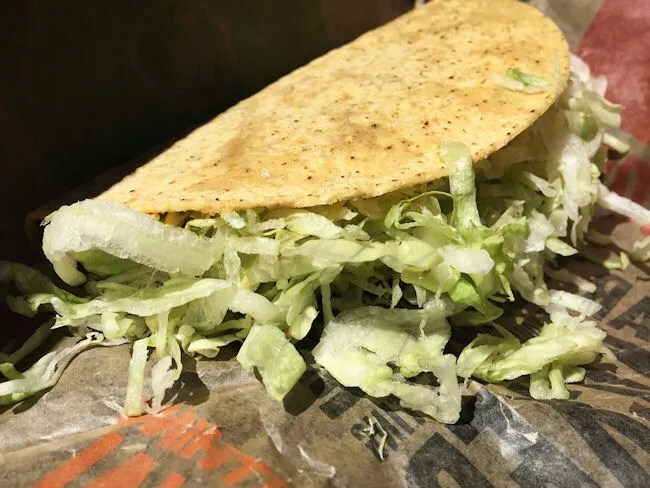 There’s more lettuce than anything…which is kind of annoying, but the taco just tastes better. J ordered the Super Potatoes Ole. This is like nachos but with what is essential tater tots. 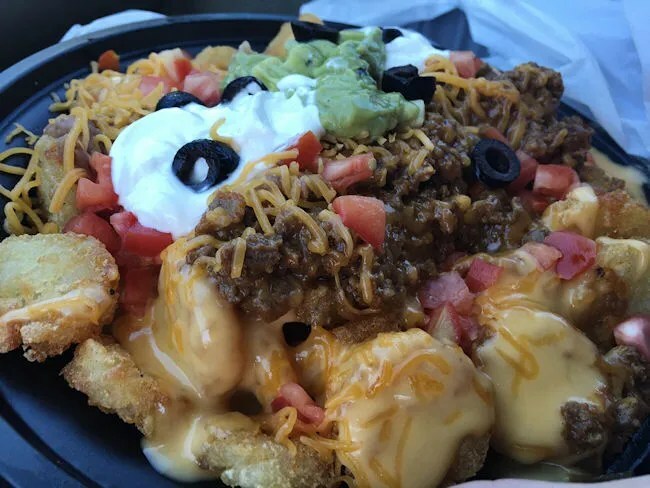 The potatoes ole is a side item on the menu, but this creation is served in a bowl and topped with beef, beans, cheese, black olives, guacamole and sour cream. Like I mentioned, the potatoes ole are basically tater tots with a special seasoning on them. They’re delicious on their own, but served as a nacho bowl…that’s something else. The bowl was too big for J to finish. She ate about half then asked if I wanted some, but I was actually kind of full for some reason. We brought it the rest of the way to Chicago with us and I ate a little bit of it just to see what it tasted like. 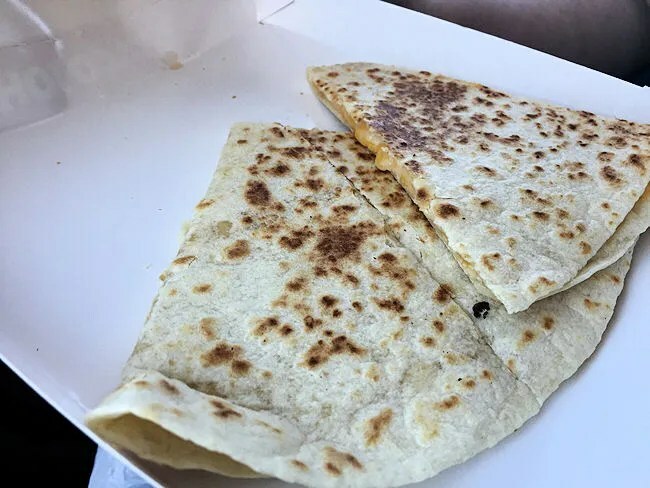 We kept things simple with L. She likes the cheese quesadilla from most of the fast food taco places, so that’s what we got her. She was a little impatient with us getting it to her. She was obviously hungry. The quesadilla was simple. Just a flour tortilla and cheese and that’s what we wanted. L was happy with it. She ate it and that makes us happy. The cost for the food (no drinks because we all already had something from a Speedway stop before we left Kalamazoo) came out to just over $13. I’ve longed for a Taco John’s closer to Kalamazoo and hopefully this is a start. I read somewhere that this is actually the second Taco John’s in Stevensville…there used to be one down by the Big Boy….so there’s got t be at least a little bit of demand for it if they came back. All in all, Taco John’s is a fast food taco. It’s the same layout and same basic principle, but I just enjoy the food from Taco John’s so much more than I do from the “other” place. 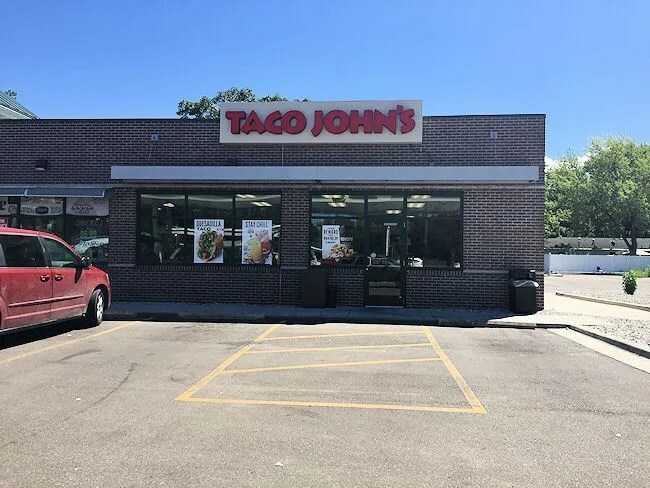 Just to let you know…there used to be 2-3 Taco John;s in Kalamazoo…LONG time ago…where the muffler place is on Westnedge by the McDonalds and Romence used to be one…also used to be one on Stadium Drive…good times…this was like 30 years ago….